Music Streaming app Deezer finally released its Android TV app following its Google Home integration a few months back. The app includes a voice-recognition feature which can be triggered using voice controls. The streaming app offers both free and paid streaming options along with radio and podcast features. Popular music streaming app Deezer finally released its app for Android TV users. The app is already available for Google Android and Google Home devices, but Android TV users were left with only a web-app that lacked proper integration of core features offered in its native apps. The new app is in line with Google’s Material Design and offers a much friendlier user experience than its previous web-based solution. The music streaming app is available in both free and paid iterations. The free version of the app includes all of the content in an ad-supported format. The paid version is an ad-free experience as well as some signature features that are exclusive to the premium version of the app. The service also allows users the option to buy a Family account which allows users to have a shared account with friends or family members, bringing down the cost of membership per member significantly. The app does not command the same amount of content as Spotify, but you will get access to popular content quite easily. Some of the Android TV features like song detection and Flow Plus make the service more appealing than Spotify when it comes to features. Some of the features of the app are country-specific and are not available to all users. Users can set their country to the US to bypass these restrictions when creating a Deezer account. The app allows you to browse through Radio channels, podcasts and search for music. Lyrics support and song recognition are available for the app as well. 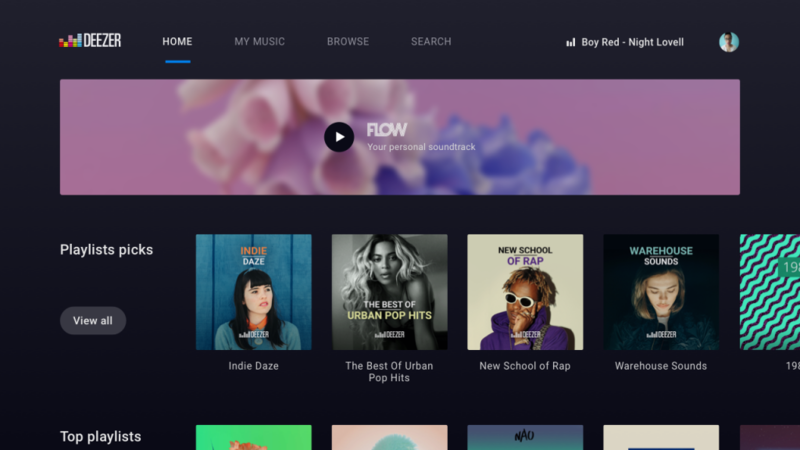 The Google Android TV version of the app comes with song recognition support, allowing users to search for music playing on the TV or in the background. 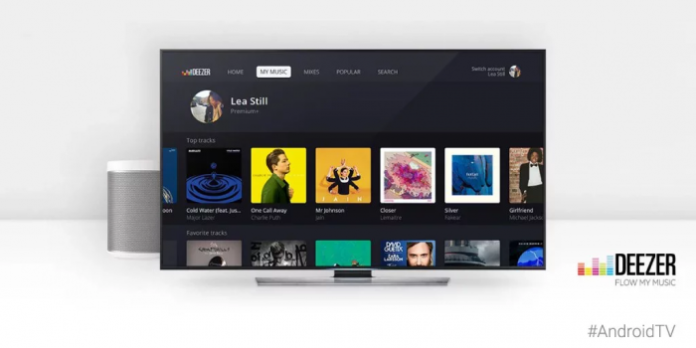 The app can be downloaded from the Play Store through any web browser for your TV, or you can directly access the store page from your Android TV. Deezer is available under the Music and Audio category and has already rolled out to all regions.